Scrap This, Save That: WOYWW 278 - A Pile Of Pages! Yay for hump day and the middle of the week! And yay for What's on Your Workdesk Wednesday!! WOYWW is our weekly tour of craft desks around the world. Jump in and see where the links take you! 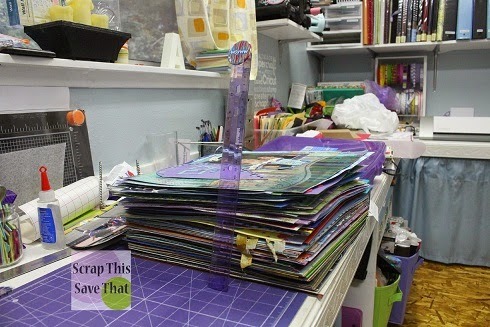 On my desk this week is my ruler measuring 5 full inches of finished scrapbook layouts. You've seen parts of this stack before but I finally got the journaling on them finished. Now they just need to be sorted and put into books. I'm still not quite sure how I'm going to sort them yet...they span so many years, but I guess its not permanent. I can always slip them out and put them in other books if I decide to rearrange! Can you see the WOYWW button/badge this week?!?! Wow that is some serious scrapbooking, something that I really should catch up on. Good for you I hope you had fun. Yep - found your badge. Great work - all those finished pages - well done you! Well done Amy - great job done! I'm OK at journalling as I go, oddly enough, considering my skill at putting everything else off. Oh my word, the satisfaction of filing that lot! What a sense of accomplishment you must have for completing the layouts. Hope you continue with them momentum. All I can say is WOW! Look at that pile of pages!!! That's an amazing stack of page layouts. Hope you manage to get them sorted soon. What an amazing pile of layouts! Do spread 'em out sometime and photograph them all so we can all enjoy them! I spotted your badge eventually, after a lot of searching! It's very well camouflaged.